Allicin from garlic has anti-fungal properties which may help kill the stubborn acne causing bacteria and stop annoying acne breakouts. Use fresh organic garlic clove, peel and cut it, apply a little pressure to release some juice, rub it on the acne breakout and wash off with cold water after 10 minutes, everyday for at least two weeks. You can also mix garlic with vinegar or yogurt. Alopecia areata, a common autoimmune skin disease, also known as spot baldness, can be treated naturally. According to a research, this condition in which body attacks its own hair follicles, can be successfully treated topically with garlic gel and betamethasone valerate ointment applied directly to the hair follicles. It is very easy to treat ringworm, a common fungal skin infection that develops in the epidermis and the layer of skin, also known as dermatophytosis or tinea. Garlic has an antifungal property called ajoene, which makes it an ideal choice to cure topically fungal infections of the skin like ringworm. First of all, do not use garlic directly on your skin, because it can cause symptoms like redness, itchy skin, or inflammation. 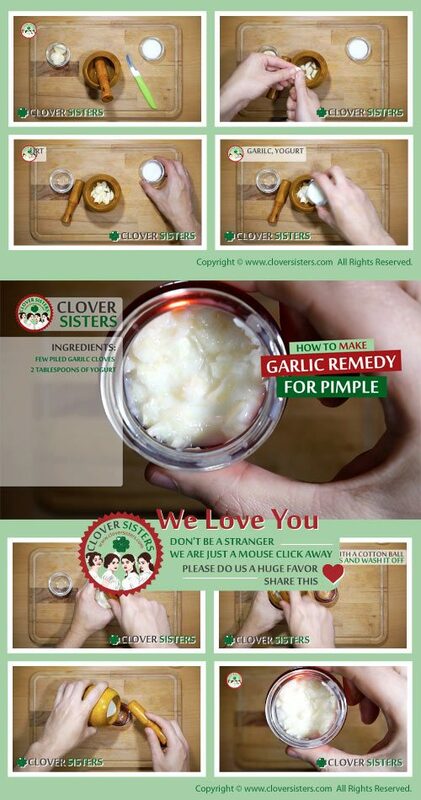 Antibacterial properties of garlic are very useful in treatment in pimples. The best way is to blend few piled garlic cloves with 2 tablespoons of yogurt. Rub this mixture over the pimples with a cotton ball for a few minutes and wash it off. After that do not touch your face.